The British Civil Wars has always interested me and International Women's Day prompted me to focus my blog post on a crucial, controversial, yet often overlooked, figure in British history, Henrietta Maria. I came across little, other than biographical histories, of the French Queen, to whom Charles I was seemingly devoted. In an era where all women were expected to be obedient and submissive, playing no role in the 'male' sphere of government, this omission may seem understandable. However, the more I delved into Henrietta Maria, the more apparent it became that she contradicted these 17th-century expectations of feminine ideals. And the more she seemed, to me, to represent a head-strong, loyal and driven Queen, who worked tirelessly for the Royalist cause. Considering the lack of detailed history (until more recent works) regarding her involvement in the Civil War, Henrietta Maria was certainly a divisive figure to contemporaries. Even pre-Civil War, Henrietta Maria, being a French Catholic, was not a popular figure in England. However, her unpopularity reached new heights in 1642, as she was now seen as a meddling French Catholic, who had undue influence on the King. ‘ …the King was eclipsed by the Queen, and she perswaded him that the Darknesse was Light and that it was better to be a Papist, then a Protestant…’. Though the extent of her influence over Charles is debateable, Henrietta Maria's own Catholicism was a genuine source of contention between the two sides, causing a greater division than there may have been otherwise. Whether it was due to having the 'misfortune' of being both Catholic and French, or simply her tireless efforts in aiding the Royalist cause, Henrietta was regarded by many Parliamentarians as being an 'obstacle' to peace in England. After attempts by Parliament to negotiate with Charles I in 1642 and 1645, Henrietta Maria made her feelings known to Charles I. The Uxbridge Treaty of 1645 stated that Parliament should have the right to control the militia and foreign policy; the Solemn League and Covenant must be adhered to by Charles; and episcopacy must be abolished. Henrietta Maria – some might argue quite shrewdly - warned her husband that 'if you consent to this, you shall be lost'. She was, in Parliament's view, a scapegoat for Charles' weak government and inability to rule - Charles did not represent the ideals of masculinity, and Henrietta Maria did not conform to the prevailing ideas of a woman's role. In summary she was one of the constant leading Royalist figures and regardless of the extent of her influence over Charles, her role within the Civil War was of great importance; her perceived influence deepened the division between the two sides. She was a genuine concern for contemporaries, 'invading' the male sphere of politics and threatening the natural order of authority, and, in some ways, contributed to the downfall of her husband. Because of this, she must not be banished to the side-lines of the history of the British Civil Wars. 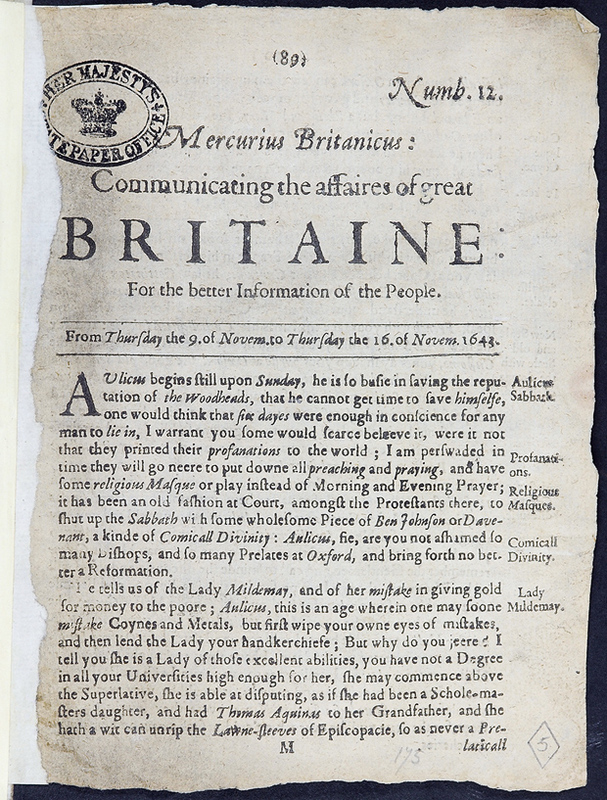 An example of Parliament's newsbook from 1643 (The National Archives reference: SP9/245/19). Other editions are available at the British Library. Anon, Great Eclipse of the Sun, or Charles His Waine Overclouded, by the Evill Influences of the Moon, the Malignancie of other Ill-aspected Planets and the Constellations of Retrograde and Irregular Starres (1644). Held at the British Library. Fairfax, T., The King's Cabinet opened: Or, certain packets of secret letters & papers (London, 1645) Held at the British Library and a copy available to view on Google Books. Fantastic piece on gender in history and its role in the civil war. A great read too! Beautifully written, well researched, very informative. Love the work. Not forgotten by us! We recently named our lovely daughter Henrietta, with this history in mind. There is also a biography in hardback of Henrietta Maria by Dominic Pearce, published by Amberley on 15th November 2015.